Happy Friday readers! After posting my 2012 Blog Planner, several people requested that I use the same format and create some journaling pages. I shared them with my Proverbs 31 study ladies, and now I’m sharing them with all of you! Take the pages to a local office supply store and have them spiral bound with a clear plastic cover for durability. Journal your thoughts, plans, feelings, ideas, and more! I hope you all enjoy the printable journaling pages! 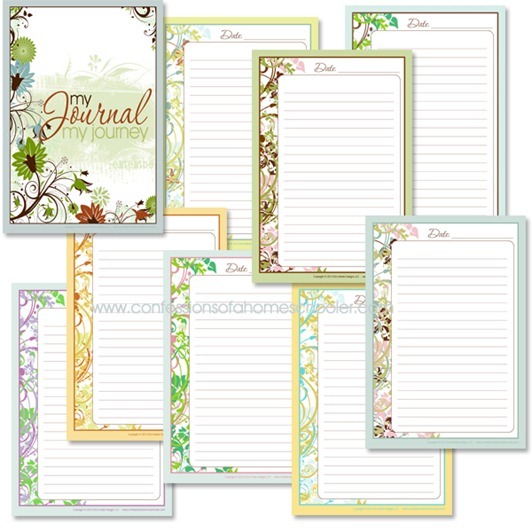 They are also good for student journaling…sorry, I know they’re kind of girlie, but they were originally created for the ladies in my study group. So pretty – thank you for sharing this! My daughter will LOVE this! These are gorgeous. Thanks for sharing with us. Thanks for the post. Come visit me at toddlersthroughpreschool anytime and leave some feedback! They are beautiful!! Can’t wait to use them!! I use the blog pages and LOVE them! I actually have my Blog Planner right in front of me:) Thanks for creating beautiful things and sharing them!! I’ve been wanting to buy a pretty journal to record my notes from my daily Bible readings but feel guilty spending money on things like that. How sweet of you to share these! They are beautiful. Thanks!! Thank you, Erica! These are beautiful! Hi! Thanks for sharing these! How pretty! I was just on your site trying to purchase your Expidetion Earth package and am unable to use my card through PayPal (I’ve NEVER been able to use it on PayPal. Not sure why). Any way I can purchase it another way? What a beautiful journal! thank you so much for sharing with us. Wonderfully beautiful. Thank you for sharing so generously. As a non-journaler, I find myself wanting to start just because of your thoughtfulness to share with all! Your paper are so very pretty! Thank you!